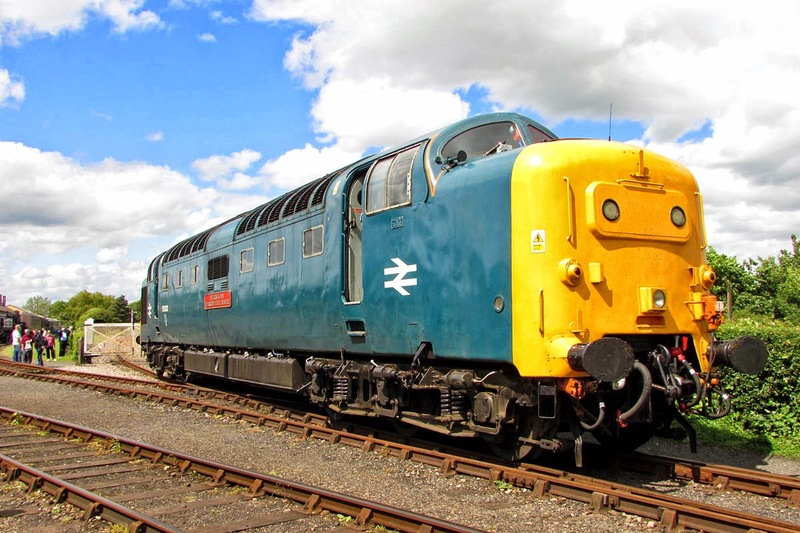 D9002 was delivered to BR service on 9th March 1961, and was a North Eastern Region locomotive, allocated to 52A Gateshead, later transferred to York in May 1979. It was named King's Own Yorkshire Light Infantry at York on 4th April 1963. 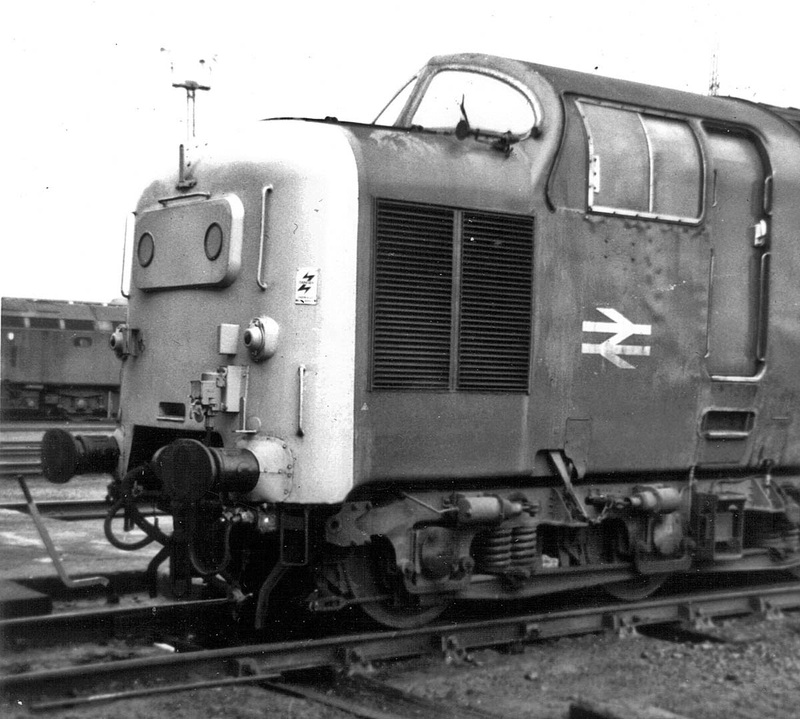 It had a Heavy General Repair at Doncaster between March and November 1976. 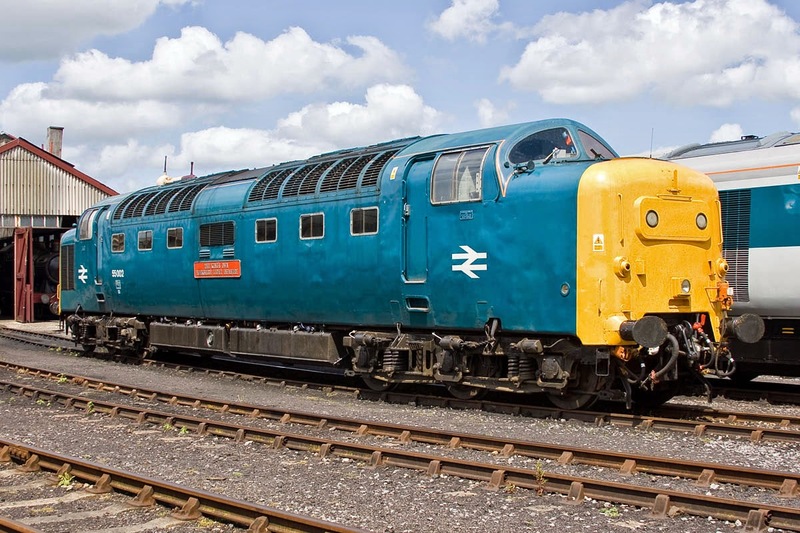 Last in traffic on 30th December 1981 and withdrawn on 2nd January 1982, after it was immediately preserved at the NRM. 55002 is still running on cast bogies. 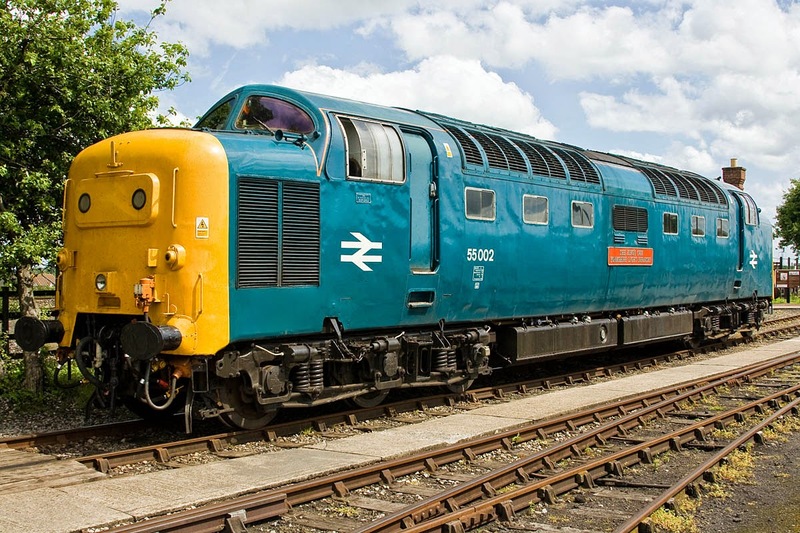 BR reclaimed the cast bogies from the other preserved Delitics and substituted prefabricated bogies, coming from Class 37's which share the same design. The crane in the background is LMS RS 1054, later ADRC 95204 which was allocated to Haymarket for a number of years, so the two were often alongside in BR days. Outside Didcot Shed with HST prototype power car alongside. Preparing to enter the running line. 55002 at Haymarket on 27th February 1980, when allocated to York, but before the repaint in October of that year. 40077 in the background. 55002 had worked north on 1S12 05:50 Kings's Cross - Aberdeen as far as Edinburgh, and later worked south on 1E42 23:15 Edinburgh - King's Cross "Night Scotsman" sleeper. 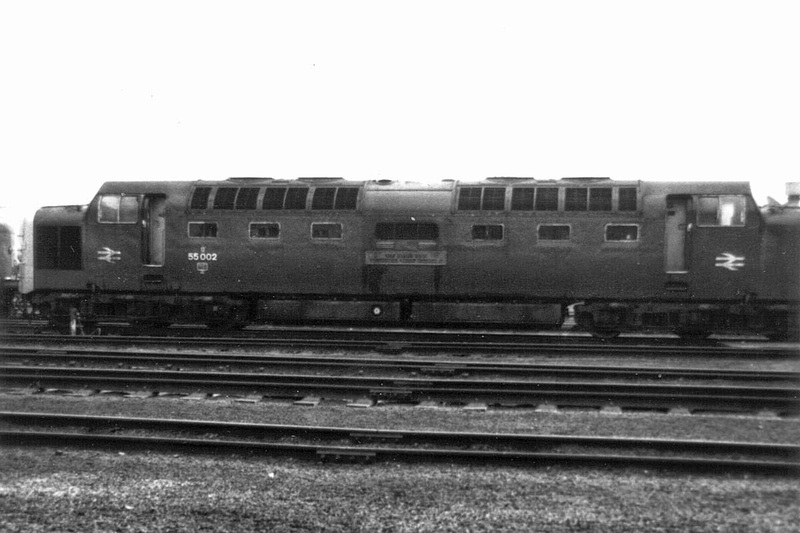 At this time this was a regular Deltic diagram with layover at Haymarket, less intensive work as HST's took over the leading duties. Much, but not all of 55002 - it was an Instamatic, it was all in the viewfinder. 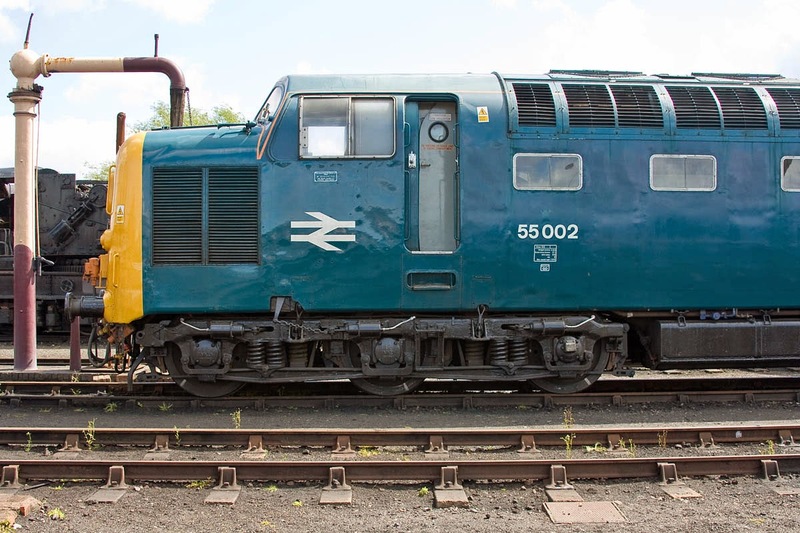 I suspect from my notes that the nose on the left is 46049. I first noted 55022 on 16th October 1978 at this location.